If the oven doesn&apos;t heat evenly or doesn&apos;t heat at all, the oven thermostat - ERC (Electronic Range Control) or probe may be malfunctioning. First, determine how much the temperature in the oven is off from the control setting. To do this, put an oven thermometer on the center rack inside the oven and turn the oven on for about 20 minutes, with the thermostat set at any range between 300 degrees and 400 degrees Fahrenheit. If the oven thermometer reads 25 degrees either lower or higher than the oven control setting, the oven thermostat - ERC or probe should be replaced. Step 1: Turn off the power supply to the range. Then remove the burner. Step 2: Soak the burner in a solution of mild household detergent and water. Clean it with a soft cloth. Caution: Do not use a toothpick or matchstick to clean the gas ports. If the tip of the wood gets stuck in the burner ports, it could cause a serious blockage. 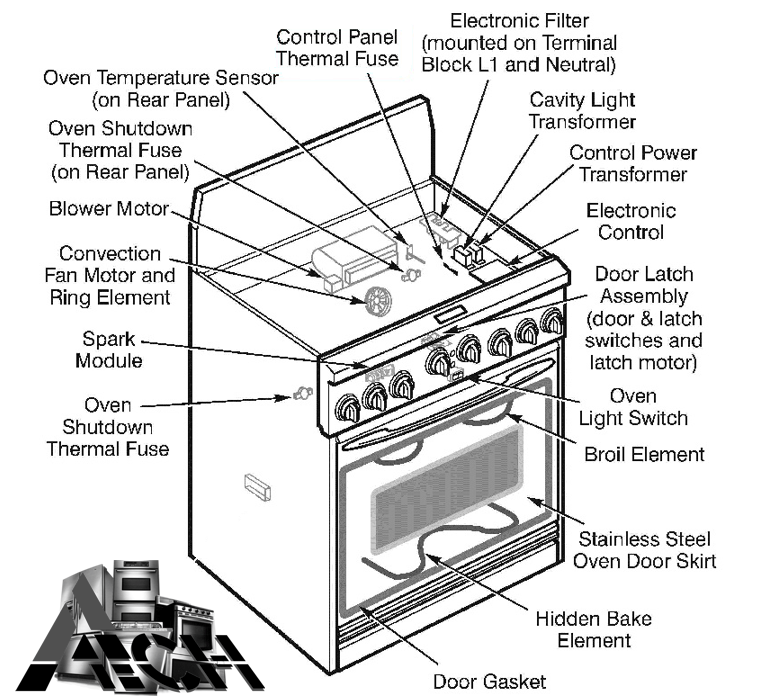 Gas oven ignitors are generally the source of trouble that has to be replaced when the oven won&apos;t heat up properly. This is the most popular system currently used for ovens and is comprised of a control mechanism (whether thermostat or electronic control), the oven ignitor, and an oven gas valve. What happens in this style ignition system is that the thermostat or electronic control switches power to the oven ignitor and gas valve circuit which are connected in series (one after the other). As power flows through the ignitor it heats and draws current (measured in amperage). Once the oven ignitor draws a specific amount of current the oven valve opens to allow gas to flow to the oven burner where the glowing hot ignitor (glow bar) ignites it. Power must continually flow through the ignitor and oven gas valve for gas to be released into the oven burner to create a flame. Once the set temperature is achieved the control stops all power to the ignition circuit which causes the ignitor to dim and the oven gas valve to close, stopping any burner flame. Cycling on and off continues to maintain the specific temperature the control is set for. It should usually only take in the area of 30-60 seconds for the oven ignitor to reach the proper resistance to allow the proper amperage to reach the gas valve to open it and for the ignitor to ignite the gas at the oven burner. Weak oven ignitors can glow but not achieve an adequate resistance to allow the correct current to flow to the gas valve for it to open. They can also glow, but not be quite hot enough to ignite the gas immediately. The problem with your stove/oven can be difficult to pinpoint without a clear indication of a specific defective component. Call us today for a same-day examination!